Surveying the life of Feyhaman Duran – one of Turkey’s most beloved painters and the father of Turkish portraiture – it’s clear the artist had many admirable attributes: he valued integrity above financial gain, practised moderation and treated his students at the Academy of Fine Arts with kindness and respect. Yet all that pales in comparison to the artist’s enviable relationship with his wife and fellow artist, Güzin (above). The pair lived a modest life in Istanbul, united in their devotion to art and their marriage. As Maureen Freely writes in Cornucopia 42, ‘They understood their life together as their greatest work of art.’ Throughout the upheavals of the early 20th century, Feyhaman and Güzin continued to find joy in the simple acts of painting, conversing with one another and being close to nature. 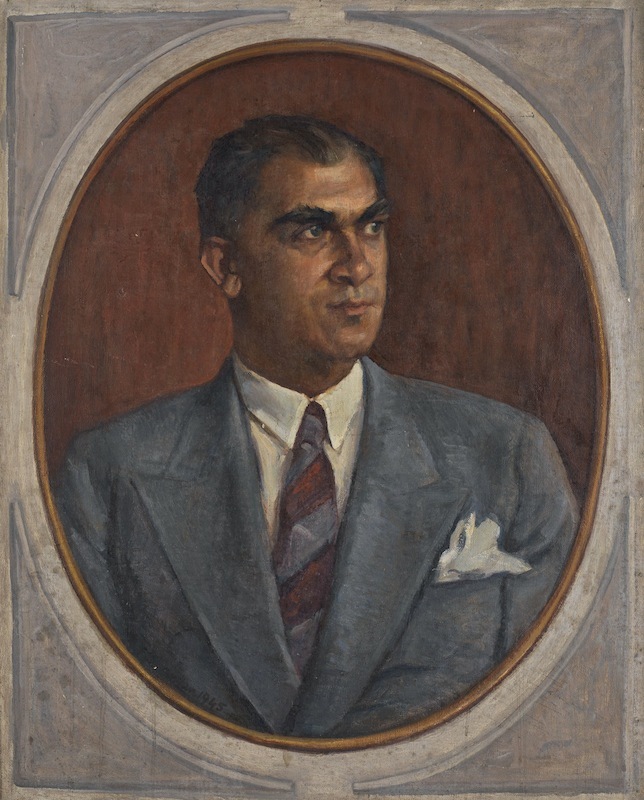 It’s no surprise, then, that out of all the portraits Feyhaman painted, his depictions of Güzin – the person he loved the most and knew the best – are some of his most vivid, demonstrating his unique ability to produce a likeness that simultaneously reveals the sitter’s inner world. Feyhaman Duran: Between Two Worlds, a landmark exhibition at the Sakıp Sabancı Museum, displays many of Feyhaman’s portraits of Güzin, as well as others that won the artist acclaim. Yet his portraiture is only one piece of the story. 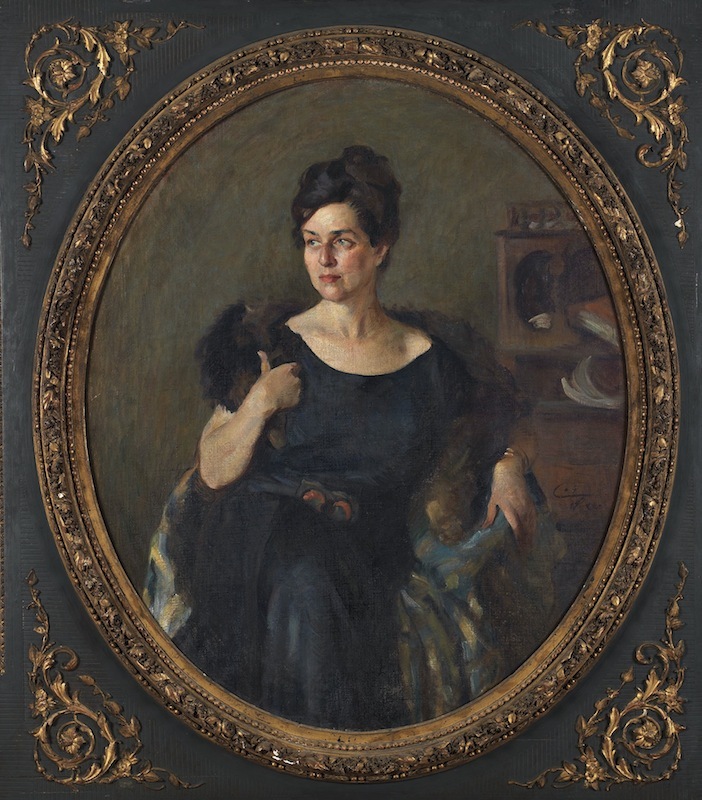 Drawing on paintings and artefacts from the Feyhaman Duran Collection at Istanbul University and the Sabancı Museum’s permanent collection, the exhibition demonstrates the versatility of this prolific painter – who alongside portraiture was also skilled in landscape and still-life painting – and sheds light on his private life. The entry to the exhibition understandably emphasises Feyhaman’s portraiture, the work that brought him renown. Three self-portraits are among the first works to greet the visitor. His one dated 1911, in which Feyhaman glances to the side, his eyebrows lifted and his lips curled up slightly at the ends, conveys the exhilarating mood of the period. Painted while Feyhaman was studying in Paris. It is a fine example of his skills, with a hint of what he and other artists of the 1914 Generation would later achieve on their return home: the reshaping of Turkish painting. Portraits set the course of Feyhaman’s career. Born in 1886, the artist lost both of his parents at a young age. In accordance with his mother’s last request, Feyhaman was sent to study at Galatasaray High School, where he was almost always first in his calligraphy class. His teachers recognised his skill at drawing in pen and ink, and later oil, and hired him to teach calligraphy after his graduation in 1908. Feyhaman dreamed of studying in Paris, the centre of the art world, but lacked the financial means to do so. But his luck changed in 1910, when on the request of an acquaintance he painted a portrait of the young daughter of an Egyptian prince, Abbas Hilmi Pasha, from a photograph. Blown away by Feyhaman’s talent, the prince commissioned portraits of his family members. In the same year he sent the artist to study in Paris. 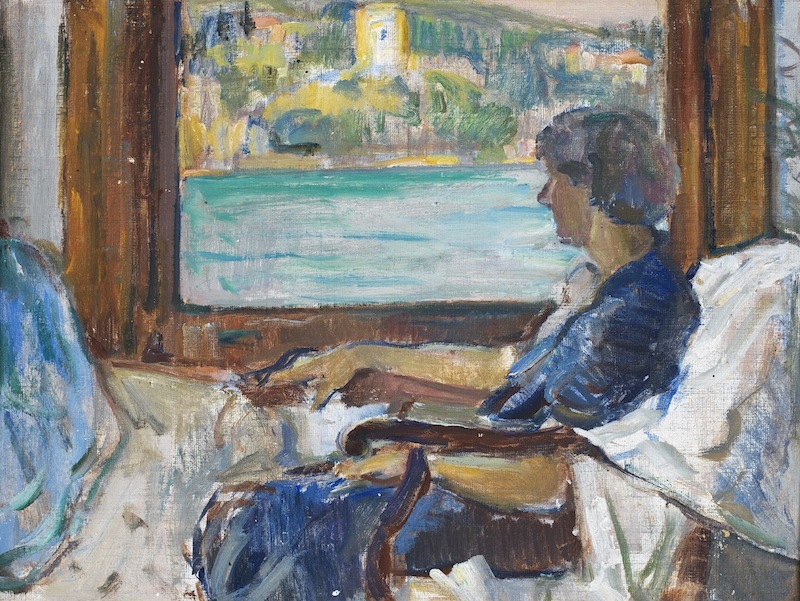 Feyhaman’s time in Paris, where he trained in the true-to-life but high-minded style favoured by the academy and independently explored contemporary artistic trends, was cut short by the outbreak of the First World War in 1914. Upon his return to Istanbul, the artist focused on what he knew best: portraiture. He was able to make ends meet with the help of patrons who commissioned portraits, many of them displayed to critical acclaim at the Galatasaray Exhibitions. 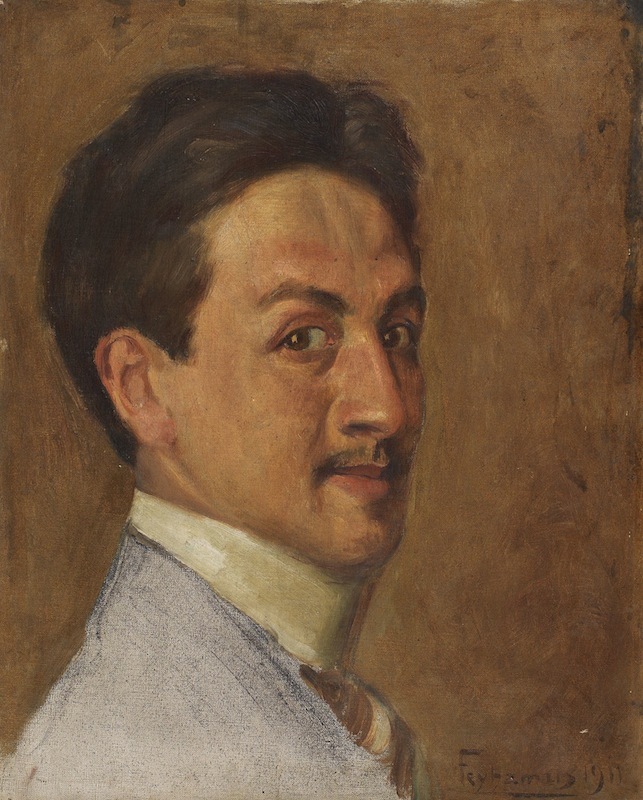 According to the exhibition catalogue, a reviewer described Feyhaman’s 1921 portrait of the doctor Celal Muhtar Bey as appearing ‘almost alive it is so true to the original’. The same could be said for his 1921 portrait of the nurse Kermine Salahor. One of his few full-length works, the painting depicts a modern woman reminiscent of the society beauties portrayed by the American painter John Singer Sargent. Demand grew for Feyhaman’s portraits during the formative years of the Turkish Republic. By then he held a position at the Academy of Fine Arts and was commissioned to paint the leading politicians of the Republican era, from Presidents Mustafa Kemal Atatürk and İsmet İnönü to the reformist education minister Hasan Âli Yücel. The exhibition dedicates an entire room to these works, which are displayed alongside portraits of important intellectuals of the time; each painting is accompanied by a short biography describing the subject's achievements. By putting the history of Turkish modernisation on canvas, Feyhaman became a first-hand witness to the social transformation taking place in the young country. The exhibition stresses the fact that Feyhaman straddled two eras – witnessing the transition from the Ottoman Empire to the Turkish Republic. Equally emphasised is the time he spent studying art in Paris in the years leading up to the First World War. 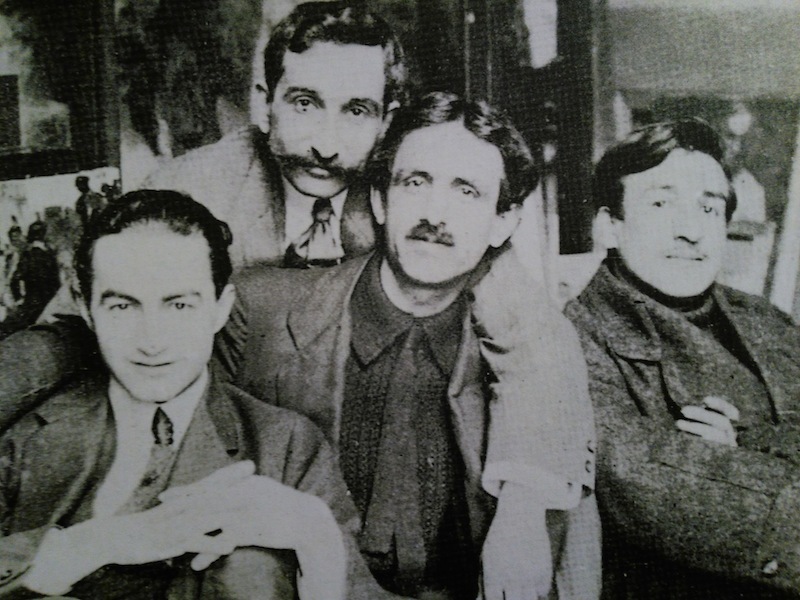 When Feyhaman and other Turkish painters studying in Paris returned to Istanbul, they brought with them new ideas that would come to define the 1914 Generation, as they became known. 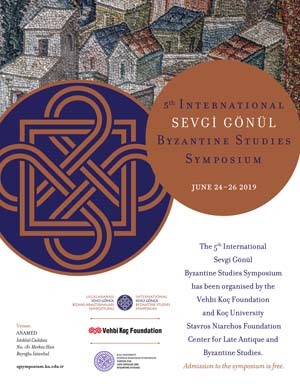 Archival materials illustrate how their experiences abroad had a large influence on the development of Turkish painting. 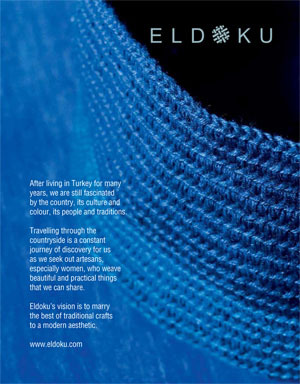 However, whether Feyhaman’s work ‘carries traces of the country’s transformation from the Ottoman Empire into the Turkish Republic’ or ‘reveals all the clashes and the developments of the era’ – both claims put forth in the exhibition – is less clear. There are glimpses of Feyhaman’s commitment to traditional Ottoman arts in his modern works. He trained in calligraphy and painting, and practised both throughout his life, as evidenced by his calligraphic panels on display. Moreover, some of his compositions and still-life paintings incorporate Ottoman works of art and handcrafted objects found in his home. 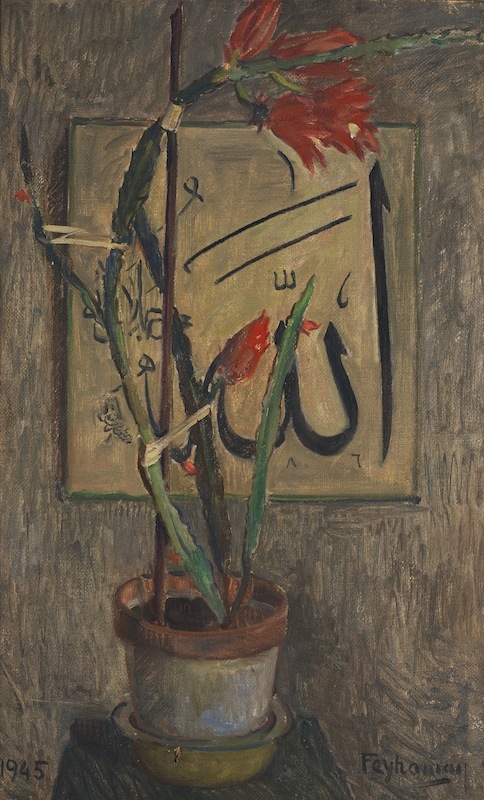 The above still-life depicts a calligraphic panel by Şefik Efendi bearing the Arabic inscription ‘How high is the glory of God’ in celi sülüs script, hanging behind a false Christmas cactus (Schlumbergera truncata). Objects ranging from prayer beads to porcelain aşure jugs can be spotted in his paintings, an indication that Feyhaman never lost sight of the past. 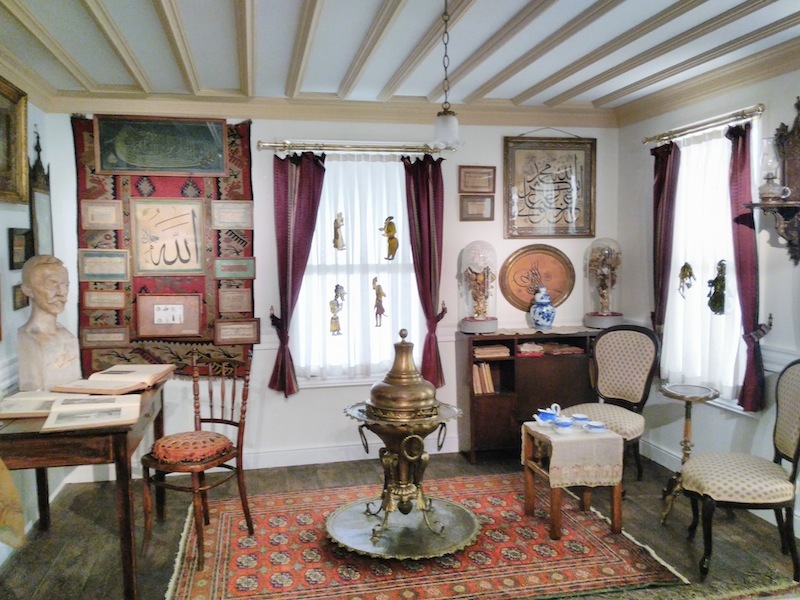 You don’t have to take the curators’ word that these Ottoman objects were in the artist’s house: three rooms from Feyhaman and Güzin’s home in Beyazıt have been recreated in the exhibition space. It’s nothing short of a miracle that the house and its objects have survived to present day. After Feyhaman bequeathed the small wooden structure to Istanbul University in 1970, the doyenne of Turkish art history Nurhan Atasoy worked tirelessly to save the house from being demolished. She took full responsibility for its maintenance – ‘covering all the furniture with dust sheets and preventing leaks through the roof when it collapsed in places’, she writes in the catalogue. As part of the collaboration between Istanbul University and Sabancı Museum, the latter agreed to temporarily store all of the artefacts from this shoebox of a house while it undergoes restoration. Visitors benefit from a glimpse into Feyhaman’s private quarters, which reveal how he lived and worked, as well as his attachment to the traditional arts. Feyhaman may be known as portraitist, but his landscapes are equally exquisite. These works reflect the artist’s interest in Impressionism, cultivated during his time in Paris. Although his landscapes were at times more realistic and at others more narrative, they were always warm – he illuminated Istanbul with impressionistic light. Later in his career, particularly after his retirement from the Academy of Fine Arts in the 1950s, he focused his attention on landscapes, even dabbling in abstraction. 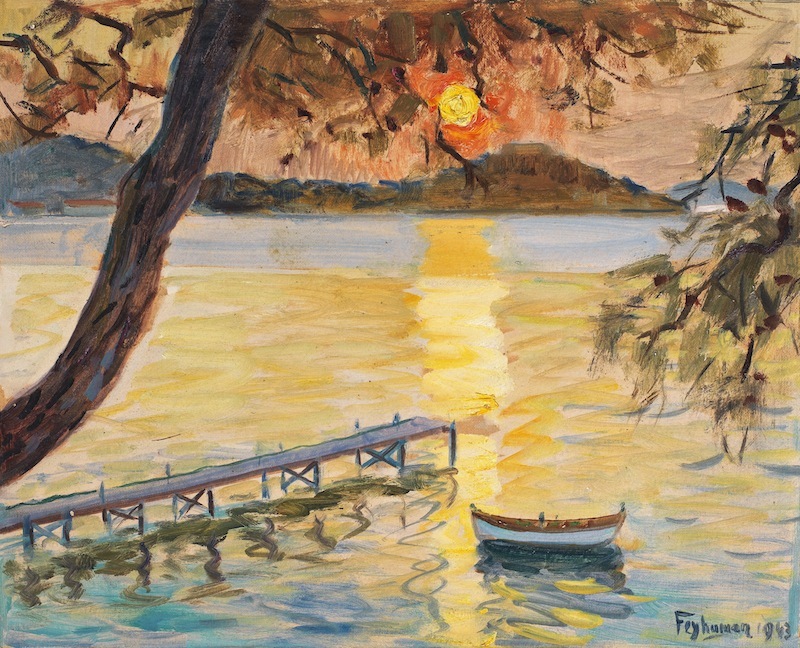 The above image is one of many paintings he made of a wooden jetty in Büyükada. Feyhaman uses lively blues, yellows and oranges to capture the sun setting over the sea; the visible brush strokes add to the exuberance. A fast worker, he would often paint the same spot over and over again from different vantage points and at different times in an effort to capture the spirit of the view. There’s something pure about Feyhaman Duran. By all accounts he was naturally gifted, especially in the art of portraiture, although he took pains to learn the rules of academic painting. Yet he adapted anything he learned to his own style, rather than subsume himself to a particular movement – as he put it, ‘the eye of the painter sees best’. The more than 1,000 works and artefacts in the exhibition, the result of a fruitful collaboration between Istanbul University and the Sabancı Museum, paint a picture of a man who was devoted to his wife and his art, found pleasure in living simply and aimed to satisfy himself. Don’t miss this unique opportunity to savour the fruits of a life well lived. ‘Feyhaman Duran: Between Two Worlds’ is on view until July 30.